Laubuka tenella, paratype from the type locality, photographed alive immediately upon capture, displaying a neon blue-green stripe and faint blue vertical bars. 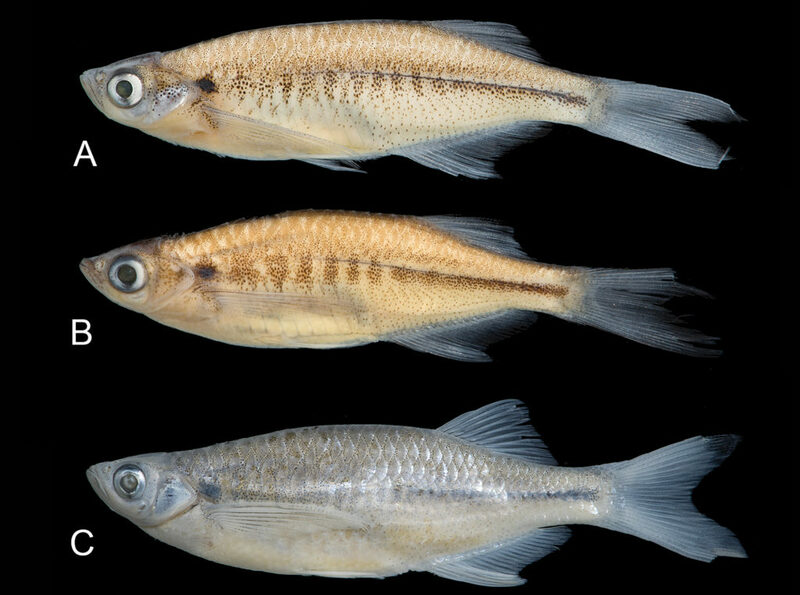 A sleek, small, and glimmeringly-hued new species in the danio clan has just been described and may offer potential for breeders serving the aquarium trade. Reaching a maximum size of just 6 cm (2.36 inches), the shimmering Laubuka tenella represents the newest addition to the ever-popular Danioninae subfamily. Discovered in the Cox’s Bazar District of southeastern coastal Bangladesh, it has also been reported further to the south in the Thandwe River drainage in neighboring western Myanmar. 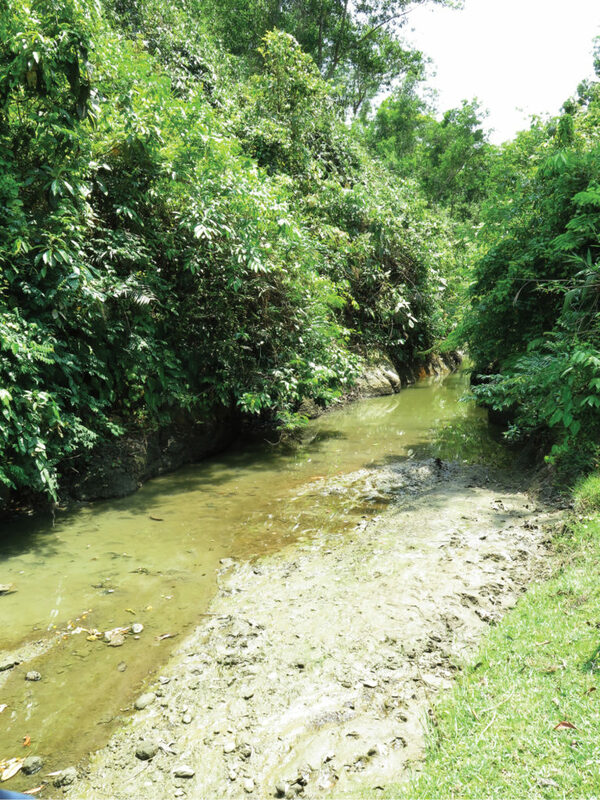 Domdomia stream, the type locality of Laubuka tenella, May 9th, 2015. The open-access ZooKeys paper, Laubuka tenella, a new species of cyprinid fish from southeastern Bangladesh and southwestern Myanmar (Teleostei, Cyprinidae, Danioninae), by authors Sven Kullander, Md. Mizanur Rahman, Michael Norén, and Abdur Rob Mollah, provides a great deal of insight into the genus Laubuka, clarifying earlier work. The paper’s authors note that Laubuka spp. are similar in many respects to the more familiar Devario genus, but Laubuka lack barbels and tend to have more muted, indistinct markings, when compared to Devario. Readers willing to dive into the species description will be rewarded with insights into the habitat of the new species; thorough descriptions of the stream composition could be quite useful in recreating the biotope of this species. The authors further provide detailed accountings of species found in situ with Laubuka tenella at each location surveyed. Depending on the specific location, one might find a range of aquarium-suitable danios, Devario species, rasboras, and assorted barbs, along with the Burmese Loach (Lepidocephalichthys berdmorei) and at times multiple gobies, owing to the coastal proximity of this species’ habitat. Humanely euthanized with MS 222 and preserved specimens of Laubuka tenella. A: holotype, DU 9004, 42.1 mm SL. Bangladesh: Chittagong Division: Domdomia stream, 10 km north of Teknaf. B: Laubuka tenella, paratype, NRM 40813, 39.8 mm SL. Myanmar: Rakhine State: Thandwe River drainage, Nan Chaung, near Thandwe. C: Laubuka tenella, paratype, NRM 67380, 46.8 mm SL, preserved in 95% ethanol. Bangladesh: Chittagong Division, Majerchora stream, 10 km south of Cox’s Bazar. Laubuka tenella is a new species characterized by the colour pattern, consisting of short dark vertical bars anteriorly on the side, and a dark lateral band posteriorly on the side, combined with a relatively short pelvic fin and 29–30 lateral-line scales. It is separated from other Laubuka analysed by minimum 9% uncorrected p-distance in the mitochondrial COI gene. The type series is composed of specimens from small streams in the Cox’s Bazar District in Bangladesh (the type locality), and the Thandwe River drainage in western Myanmar. 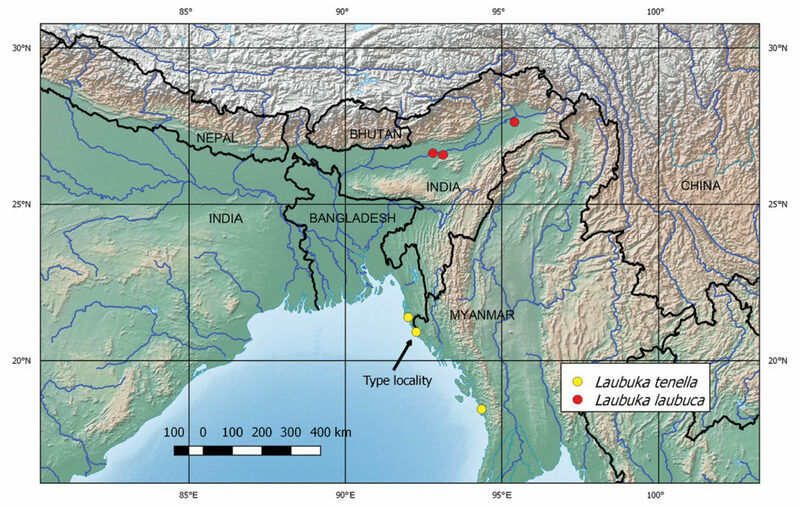 Laubuka brahmaputraensis is strongly indicated to be a junior synonym of L. laubuca, the second known species of Laubuka in Bangladesh. Eustira ceylonensis, currently in the synonymy of Devariomalabaricus, is a valid species of Laubuka.